The latest research into residual endocrine-disrupting chemicals in water in the Okanagan, largely from wastewater, suggests they are degraded by light and diluted in water. Tricia Brett recently completed her master’s thesis on the fate of EDCs in surface water in the Okanagan and found that, when given time to break down and dissipate, these estrogenic compounds are less likely to have an impact on aquatic organisms. EDCs are substances that unnaturally stimulate the endocrine system by signaling chemicals that regulate metabolism, growth and reproduction in the body. As a graduate student, Brett contributed to research led by UBC professor Jeff Curtis into the state and fate of these compounds in waters that receive discharges from local wastewater treatment plants. Research has shown that minute quantities of these compounds, which originate in pharmaceuticals, personal care products, air fresheners and deodorizers, anti-bacterial soaps and some pesticides, plastics and fabrics, can feminize fish. Such effects were first documented in the 1990s when it was found that fish and amphibians near wastewater outfalls exhibited both male and female traits instead of one or the other. Brett’s work has been funded by a partnership that includes the Okanagan Basin Water Board, the Okanagan Indian Band, Health Canada, Interior Health, and the BC Ministry of Environment. At the same time, work has been ongoing around the world to identify the compounds and what effects they’re having, as well as how to test for and treat them. These compounds are generally not removed in traditional sewage treatment processes. Here in the Okanagan, Brett found that estrone and estradiol were the only two compounds detected, and they were in the low nanograms per litre or parts per trillion. Such concentrations are so low they are difficult to measure. “One part per trillion is equivalent to one-twentieth of a drop of food colouring in an Olympic-sized swimming pool,” she explained. There is currently no water quality guideline for either estrone or estradiol in Canada. She found estrogens were undetectable in Okanagan Lake, which has a residence time of more than 60 years and a huge dilution capacity, allowing time for degradation of EDCs. There’s a reduced effect on the environment when these compounds have time, such as in a large body of water like Okanagan Lake, to degrade, she said. As a result, EDCs do not accumulate. Brett discovered that EDC degradation increases in spring and summer when the days are longer and lighter, while there is less of a reduction during the short, dark days of winter. It might be helpful to hold back release of wastewater until spring and summer to reduce the quantity of EDCs in receiving waters such as Okanagan Lake and the Okanagan River, she suggested. Rivers, she noted, are not ideal receiving waters, especially if the river is spawning habitat for fish. She recommended that further polishing of wastewater be accomplished prior to release of wastewater into rivers. Brett said there is still a lot that is unknown. 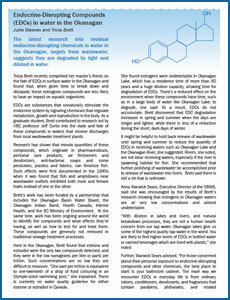 Anna Warwick Sears, Executive Director of the OBWB, said she was encouraged by the results of Brett’s research showing that estrogens in Okanagan waters are at very low concentrations and almost undetectable. “With dilution in lakes and rivers, and natural breakdown processes, they are not a human health concern from our tap water. Okanagan lakes give us some of the highest quality tap water in the world. You are likely to find higher levels of EDCs in bottled water or canned beverages which are lined with plastic,” she noted. Since 2008, two other research projects have been initiated at UBC Okanagan. Curtis and fellow UBCO professor Bruce Mathieson focused on MacKay Reservoir, which receives wastewater from Vernon’s treatment plant, and a neighbouring natural pond, Rose’s Pond. They investigated endocrine disruption in goldfish that had been released into both water bodies at some unknown time in the past. Their work shows that there is an impact to the fish from the wastewater and that the response appears to be estrogenic. There are many EDC compounds that might play a role: androgens, anti-androgens, synthetic estrogens, steroidal estrogens, personal care products, insecticides, herbicides, some medications… It is not yet clear which compounds or combinations of compounds are the culprit in MacKay Reservoir. The second project is led by UBCO professor Cigdem Eskicioglu and graduate student Hanna Hamid and involves testing the solid component of treated effluent from the Kelowna Wastewater Treatment Facility for 16 steroidal hormones. Through studies conducted at the university’s biosolids laboratory, Hamid concluded that it is possible to improve the digestion system of the type of treatment plants used in the Okanagan to optimize removal of steroidal hormones. Local treatment plants use biological nutrient removal with special bacteria, grown under specific conditions. By altering treatment conditions, it may be possible to remove endocrine disrupting compounds as well as nutrients at this large scale. Like many forms of pollution, the best solution comes from changes to individual behaviour. Try these simple steps to help protect Okanagan water. Avoid personal care products with heavy artificial fragrances, especially those with ‘Fragrance’ or ‘Parfum’ listed as ingredients. These are often synonyms for phthalates. Instead, choose natural and/or organic personal care products, make-up and deodorants. Opt for fresh air instead of air fresheners. Twelve out of 14 commercially available air fresheners tested contained phthalates. Scented candles and car deodorizers can also contain unwanted chemicals. Avoid antibacterial soaps and toothpaste containing Triclosan. It is a suspected EDC that accumulates in both the blood stream and the environment, and is known to harm aquatic life. Also, like overuse of antibiotics, antibacterial products encourage the growth of ‘super-bugs,’ harmful bacteria that are difficult to kill. Drink tap water. Water is the best of all beverages for keeping us healthy and flushing chemicals from our bodies. If your tap water has colour or chlorine odour, this can be removed with relatively inexpensive under-sink carbon filters, or Brita-type jugs. Tap water has higher safety standards than bottled water, and isn’t stored in plastic that can pollute the environment and you. Eat local and organic produce whenever you can to avoid pesticides. Okanagan farm markets are a great source. When buying conventional produce, choose those that are lowest in pesticides, usually those with thick skins. Avoid using pesticides on your lawns and gardens. Never flush leftover medications down the toilet. Return to any pharmacy for proper disposal. For more reading on how to avoid chemicals in everyday life, check out “Slow Death by Rubber Duck”, and “Toxin Toxout”, both by Bruce Lourie and Rick Smith, available from Knopf Canada. We thank the authors for providing these tips. Tricia Brett’s Masters Thesis – The Fate of Estrone (E1), 17beta-Estradiol (E2), Estriol (E3) and 17alpha-ethinylestradiol (EE2) in Surface Waters.